I have been having a blast showing these two ladies around town. My mother is in the black shirt and my Aunt is in the red. Actually, the lady in red is not my aunt but I call her aunt because she and my Mother have been best friends since they met in seventh grade. I can not imagine such a long friendship. I always have fun with them as they are game for just about anything. We all put on our pedometers and walked, and I mean we WALKED! All over, EVERYWHERE! We have had a ball running all over Northern Virginia and Washington, DC. Obviously, this picture was taken in front of the White House. This was the first time my mother had ever been to DC and she loved the buildings. I think they were both impressed. My mother loved the metro and thought it was the neatest thing since sliced bread. We ate WAY to much, drank to much coffee, and shopped something fierce. I turned forty years old yesterday. I did not feak out, quite the contrary. I was as relaxed as could be. Thirty freaked me out, boy did it ever, but forty just seemed to float on by like any other day. I am so much more content and settled now than I was ten years ago. I would not go back for anything. I might like to relive a couple of wild weekends but I wouldn't trade my life as it is now for anything. My Mother (who will be visiting for a week on Monday) always said her life did not begin until she reached forty. She then said her life REALLY began when she hit fifty, this statement was later amended. She now states that life just gets better with age. I belive her. I think the secret is staying active mentally and physically. I think the two secrets of life are moderation in everything and an engaged body, mind, and soul. If your mind body and soul are fully engaged in life everything else falls into place. I have actually been knitting quite a bit lately. Nothing fancy, just some scarves and a couple of baby / childrens sweaters. Somthing to keep me busy. I want the weather to turn so I can start a big project. I knit these two scarves for my Mother and Aunt. they will arrive Monday evening and I thought they would get a kick out of these. 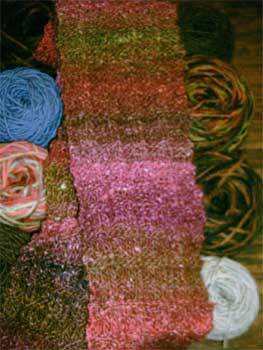 The first scarf is out of Noro Silk Garden, I can not remember the color but I think it was #84? The second scarf is some wool I had in the stash. Both the same pattern. I really like this pattern and it is probably going to become my favorite scarf pattern. 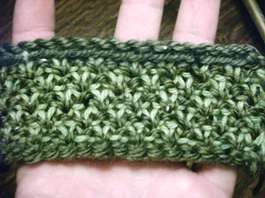 A six row repeat with great texture and just interesting enough to keep me engaged.......Tee Hee. One might notice the balled yarn in the background. I was the lucky recipient of a lovely wooden swift and a ball winder yesterday! I am so lucky. I do not know how I lived without them. I went a little crazy and would up all the loose yarn in sight. More on the little kids sweater later. I started the thing a few weeks ago and was waiting for measurements to complete the thing. The recipient in in her "terrible two's" and was not cooperative during the measuring process! The measurements were taken and I am finishing the sweater. I have been playing around with stuff in my stash making swatches. It has been fun. 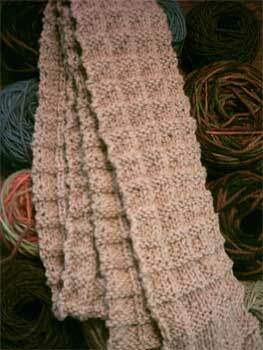 I ordered this pattern From Blackberry Ridge Woolen Mill, at Mare's suggestion. Mare is correct, the pattern is deceptively simple and I love the results. I have only played with one of the patterns but the others will be fun to try. I also fell in love with the Noro Yarns Pattern Book 2 by Jane Ellison. I want to make "James"
In Kureyon #55. A nice plain, simple sweater to show off a nice Noro yarn. 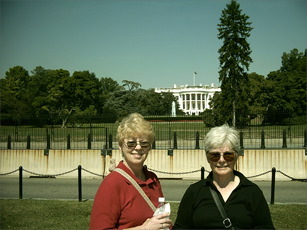 My Mother and Aunt are comming for a visit next week, I can not wait to show them around Virginia. And I am turning.......40......goodness I do not feel 40 years old, well my kness feel 40 sometimes.